A little preparation goes a long way when it comes to patching holes, nicks and dents on interior walls. Our tried and trusted tricks for patching will have your walls looking professionally repaired and painted. 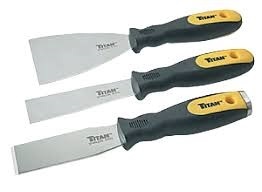 For patching and filling a stiff putty knife (metal is our preference) gets the job done. They come in all different sizes and widths for small to large jobs. 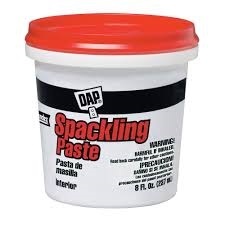 Wall compound or spackle comes in many forms from ready-mixed to large bags of powdered compound. For beginners or people pressed for time we recommend the ready-mixed. It is easy and can be used right out of the bucket. Some even go on with colour and then change to white when dry. 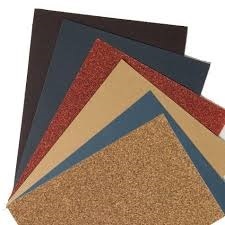 You will need a cross section of sandpaper from 150 to 240 girt. Trouble lights are great tool for pinpointing imperfections in your patching. Holding a trouble light next to your patched wall will help identify problem areas that are not perfectly flush with the wall. Drywall compound is very fine and probably not the best to breathe in. As well, the compound can be irritating to the eyes. 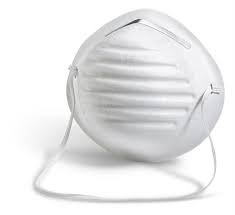 We recommend that you wear both a dust mask and safety googles while sanding. Apply your compound over the dent so that the dent or hole is completely filled. Begin to fan out the compound until the compound is flush with the wall. Wearing a mask & safety glasses sand the dry compound with a fine grit of 220 or so until the dent or hole cannot be felt with your hand. Apply another light coat of compound and allow to dry. Sand the compound until it is smooth and flush with the wall. We recommend using a trouble light to show imperfections within your patching. 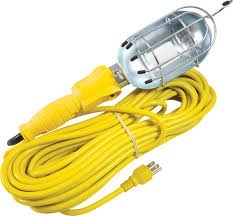 A trouble light will show if your compound is not flush with the wall. 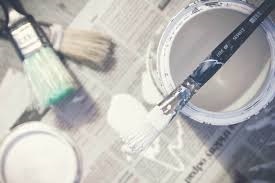 Remember any imperfection (bump, indent) will show once you paint the wall. In a darkened room shine the trouble light close to the wall and all will be revealed. Once smooth. Dust the walls lightly with a lint free cloth to remove any dust or debris. Vacuum the entire area paying special attention to removing dust in corners, baseboards etc. Once all the dust has been removed you can begin to prime all the compound. Without priming the drywall compound will absorb the moisture out the paint. This will result in the patched area looking dull & flat from the rest of the wall. This condition is called flashing. Priming all of the patched areas will eliminate this issue. Tip: professional painters use a tinted primer to make a smoother finish. Ask your local hardware store to tint your paint close to your finished colour. Some primers are available in limited colour selections. Allow the primer to dry based on recommendations found on your specific primer can. Paint and enjoy your professionally patched wall! Remember to remove the lint from your new roller by wrapping your hand in packing tape, duct tape etc with the sticky part outside. Run your hand over your roller to remove any loose lint that may have ended up stuck in your paint. Sometimes holes are too large to be just patched with compound and they require a mesh for the compound to adhere. 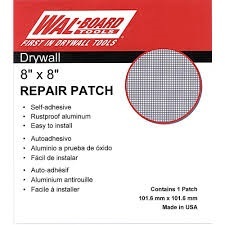 Aluminum mesh patching kits can be purchased at hardware stores. Place the metal mesh patch over the hole. Sand the edges to remove any excess mud trying to get the area as smooth as possible. You will want to apply several very thing coats of mud sanding in between coats. Continue to apply coats until you cant feel the metal patch when you run your hand over the area. Lightly sand once dry with a finishing sandpaper grit. Run your hand over the area to ensure that is it flat and flush with the existing wall. Use your trouble light to find any imperfections that are not easily felt or seen. Vacuum up all the dust from the floors, baseboards and corners before painting. Apply primer. Allow the primer to dry to the specified time on your primer’s instructions. Some people just run a roller over the area that is patched. We do not recommend this. Painting the entire wall is the best way to a professional finish. Take your time and be patient. Patching is skill that improves with practice. Taking the time and effort to make your walls smooth and dust free will ensure a painted room that is flawless. Still not sure you can do this. Give us a call. We can recommend a professional professional that can help.